The security features of a cloud storage service may or may not be a big deal for consumers, but they are critical for enterprise users. In fact, for enterprises, security is essential than any other feature. 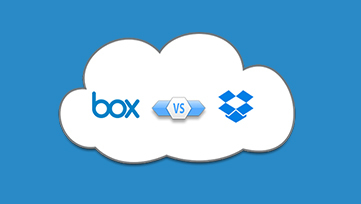 We put forward this Box vs. Dropbox security analysis for everyone who is researching the two services to choose one. Keep in mind that all the leading cloud-based storage, DMS (document management system) EFSS (enterprise file sharing and synchronization), or ECM (enterprise content management) services are good from a general security perspective. With that said, it’s vital for an enterprise or an organization to dig deep into security features to ensure that they don’t end up choosing the wrong one. Box’s security features can be fantastic for a company while some other company, somewhere, may find Box’s features insufficient or irrelevant. The case is the same with Dropbox or any other cloud-based service for that matter. At the end of the day, more than a cloud vendor’s popularity or strengths, it’s your requirements that matter a lot. Box is one of the few cloud content management and file sharing services that prioritize security. file encryption, custom data retention rules, enterprise mobility management, and many other advanced security features that an IT department of a company love to see. Box lets its user manage file access and sharing policies easily. It provides a unified and efficient way to govern critical enterprise data. The kind of control Box offers to users minimizes the risk of data loss. Box doesn’t own data centers. It, however, owns or leases the technical gear inside a data center such as servers. Box appoints its employees for taking care of those data centers to ensure maximum security. Box operates multiple data centers around the globe, and it allows its users to choose a data region of their preference. The choice is particularly helpful for those who live in countries with strict data residency laws and regulations. The ability to select a data region is particularly useful for users who don’t want to store their data in areas that are located outside of their country. Box is certified by regulatory authorities in the USA, EU, Asia Pacific, and many other regions concerning data privacy in the cloud. From HIPAA/HITECH to GDPR, Box meets security compliance set by regulatory authorities in different parts of the world. Dropbox for Business is well-known for its collaboration features and support for a wide range of devices. Over the years, Dropbox has worked on security seriously and positioned itself as a strong contender in the enterprise content and file management domain. Dropbox splits each of the files stored on its servers into discrete blocks, which then encrypted using a secure cipher. Dropbox offers a 30-day file recovery period for its free users and extends it to 120 days for its paid users. The feature allows a Dropbox user to recover a deleted file or a previously modified version, thus offering greater control of enterprise data and minimizing the risk of data loss. Dropbox has a big testing team that works round the clock to ensure user and data safety. The cloud giant also works with third-party security specialists to safeguard its infrastructure. Dropbox is an EU-US Privacy Shield certified company. Any European customer can host their data within the EU region with a Dropbox Business account that has a minimum seat count of 250. From two-step verification to file access control, Dropbox offers an array of security features for its users to ensure maximum account safety and data security. Both Box and Dropbox are excellent from a security standpoint. An average enterprise wouldn’t find a lot of difference between the two. However, organizations that emphasize security over collaboration or other features may find Box a preferred cloud partner. Security is the core of Box’s ideology whereas Dropbox often highlights collaboration.